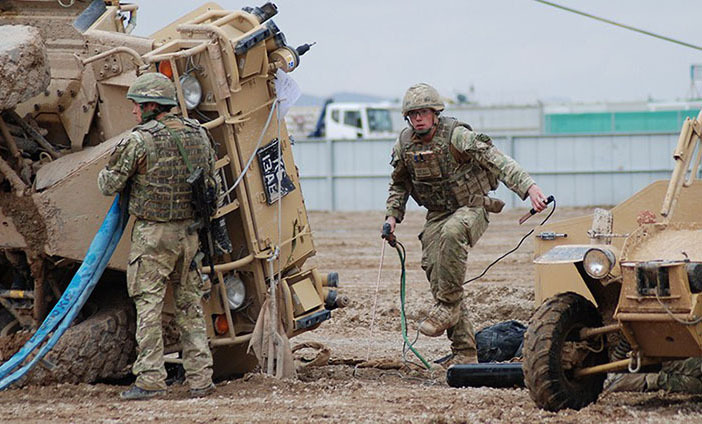 Out on the battlefield, Army vehicles can get damaged, bogged down and overturned. As a Recovery Mechanic, it’s your job to rescue them. You will use specially adapted tanks and trucks to help you do your job, which is why you will learn to drive a number of Army vehicles in training. You need to be quick-thinking and brave for this role – after all, you’ll be moving vehicles in the middle of battle. You will receive world class training throughout your career in order to develop your trade skills and expertise as a recovery mechanic. All the while, you’ll have sports and other activities to keep you busy and good mates around you. Help to recover damaged vehicles and rescue stranded soldiers. Work at the centre of the action. Use cranes, lifting gear and training in mechanical theory to work out how to retrieve immobile vehicles. Assess the nature of the vehicle recovery and decide the method of recovery. This may involve the use of winches, ropes, metal cutting equipment or the use of explosives. Basic training teaches you to be a soldier, how to survive outdoors and fire weapons. Then it’s off to the Defence School of Electronic and Mechanical Engineering at MoD Lyneham. Over the next 20 weeks, you learn how to drive a variety of military vehicles from cars to tanks. The expert training you receive will enable you to understand the principles of recovery and carry out your critical role. Basic training teaches you to be a soldier, to survive outdoors and fire weapons. Then it’s time to learn how to do your job. We’ll teach you how to bring vehicles back to a safe place where they can be fixed. You’ll also get your driving licence (for a car – category B) and your C+E driving licence (lorry plus trailer) if you don’t have them already. Most Reserve training will fit in with day job.